If you are setting up your very first AdWords campaign, you may have a lot of questions about ad groups. What are they, why are they necessary, when should you break keywords into a new ad group, where do you go to find the new keywords for your ad groups, how many keywords should I put in each ad group, and how should you set them up? Let’s dive in on everything you need to know to get your ad groups up and running. First of all, what are ad groups and why are they necessary? Well, when you get down to it, the purpose of your campaign is to show ads to your potential customers. But, for maximum effectiveness, you want to show different kinds of ads to different kinds of customers. For instance, if you are a lawyer, you want to show one kind of ad to people looking for a custody lawyer, but another kind of ad for people looking for a criminal defense lawyer. Likewise, if you are a moving company, you want to show one kind of ad to people looking for a long-distance move but another kind of ad for someone looking for a small apartment move. Enter ad groups. Ad groups are AdWords’ way of sorting which type of customers get which ads. In each of your ad groups, you categorize similar keywords together. The ads in that ad group need to be relevant to each of those keywords, so you wouldn’t put a worker’s compensation keyword in a custody lawyer ad group, or a custody keyword in a worker’s compensation ad group. So at the end of the day, if the ad copy needs to be different for different keywords, i.e. office movers vs. long distance movers, then you put those keywords in different ad groups and write specific ads for each of those sets of keywords. How Do I Structure My Ad Groups? We commonly get questions regarding ad group structure. Let’s run through them one by one. You need as many ad groups as you have unique types of ads you want to show. Most of our service-oriented businesses and lawyers want to show specific ads for each of their types of services and for each of the main towns and suburbs they serve. So for instance, if you are a multi-service lawyer serving the NYC area, you may have ad groups for divorce, custody, family, worker’s comp, and injury lawyers/attorneys, for NYC, New York City, Long Island, Manhattan, Bronx, Queens, and Brooklyn. On the other hand, if you are a small moving company that only does residential and apartment moves in the Denver metro area, then you might just want a residential and an apartment ad group for each of the suburbs you serve, like Denver, Aurora, Lakewood, Littleton and Centennial. 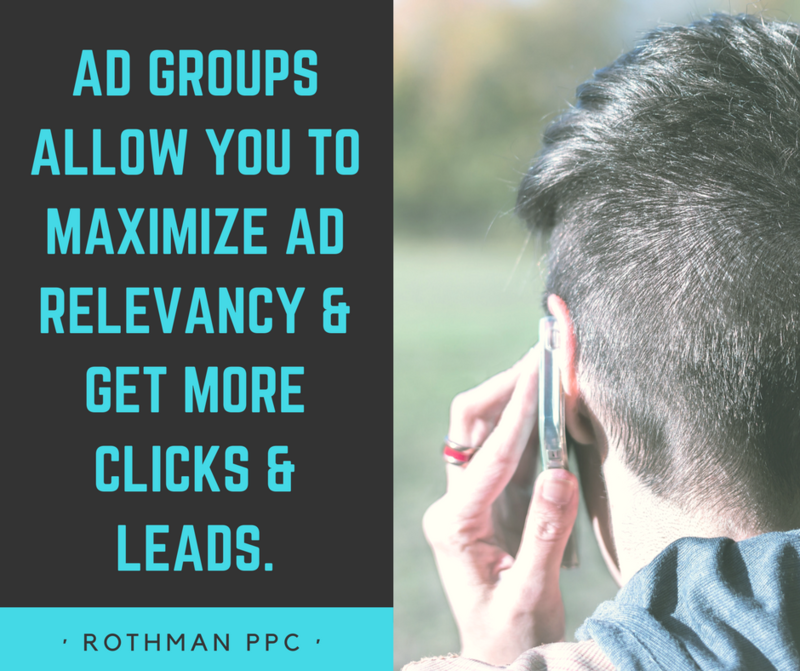 The main principle to keep in mind is that you don’t need too many ad groups; you want enough keywords in each ad group that you get decent search volume for each one. For instance, you might create a separate ad group for office movers, but you needn’t create another separate ad group for dentist office movers, since searches for specifically dentist office movers are probably slim to none. You don’t need to waste a bunch of time building out an extreme amount of ad groups. Where do I go to check keyword volume and find new keywords? You can check if your keyword ideas have volume in the Keyword Planner, AdWords’ free tool for conducting keyword research. There, you can enter in your keyword lists and your target area and get historical volume estimates for that particular geographic area. It will also show you suggested keyword ideas based on your keywords and website, and provide data on competitive bidding for your area. Finally, it allows you to group new keyword ideas into ad groups directly from the Keyword Planner and download all the data you found into a local spreadsheet. The Keyword Planner is our go-to tool, check it out! How many keywords should be in my ad group? Group keywords for the same service together. For instance, put “movers nyc”, “movers in new york city”, and similar keywords in their own ad group, Manhattan keywords in their own ad group, office movers in their own ad group, etc. Once you see what the volume is like for each keyword in the ad group, you can make the decision to break that keyword into its own ad group. For instance, if you actually do see a ton of dentist office mover keyword searches, then at that point you can break that keyword into its own ad group to have its own ads because it has proven to have real volume. You can always move keywords into their own ad groups later, so no need to overwhelm yourself with too many ad groups at the outset. Why do we even have ad groups? What’s the point? Google allows you to control which ads show up to different keywords. If you leverage that power correctly, you can show highly relevant ads to different types of keywords and ultimately get more clicks and leads. If you need a hand structuring your ad groups, finding high-quality keywords or any other element of the AdWords process, feel free to reach out to us, we’re here to help. Best of luck to you!